Putting effort into our outward appearance is not a sign of vanity. It has a significant impact on how we feel inside. Being happy means aiming to both look and feel good, but it’s not always easy to do. For mothers, how we look is not always representative of how we feel (and other times it is all too accurate). This spring, as the weather begins to warm up, we should challenge ourselves to match how we look with how we feel. *This is a sponsored post and contains affiliate links which means that if you click on one of these links and buy a product, I may earn a small commission at no additional cost to you. Rest assured that I only recommend products that I love from companies that I trust. Furthermore, I am not a medical professional and nothing in this post should be taken as medical advice. I am simply a mother who has been there and lived to tell the tale. How we look on the outside all begins with how we feel on the inside. Self esteem comes from within and if we are happy with who we are, it shows in a physical way. If you are struggling with stress, anxiety, depression, or substance overuse, then the first place to start is therapy. Working with a therapist, either in person or online, can help you manage everything that is creating self-doubt or a poor self image. Online therapy in particular, is extremely convenient, especially for moms. Schedule your online or video therapy sessions over the winter, ensuring that you get the most out of spring and summer. Weight issues are some of the most common hurdles to looking and feeling good. As mothers, we’ve stretched and shrunk, been cut open, torn apart and pieced back together. Our bodies have changed in so many ways and it can be difficult to accept it as it is now. One way to look and feel good is to forget about the extra skin on our stomachs or how much we weigh and just focus on being healthy. Exercising to stay healthy is different than exercising to lose weight or tone muscle. Don’t worry about counting calories or inches, just try to eat healthier food and incorporate vitamins and nutritional supplements to avoid deficiencies. If our main focus is on being “healthy” rather than being “fit” there is less pressure on us to meet certain goals and we can learn to love our bodies again. In addition to being healthy, we also need to feel strong. Strength comes in many different forms. We can train ourselves to be physically strong by joining a gym, lifting weights, swimming, or playing a sport. It’s important to find emotional and mental strength, as well. Try meditation, journaling, art or aromatherapy. Being strong, both physically and mentally will inspire confidence and a sense of pride in ourselves. Your outward appearance tells the world about you, so what is it you want to say? Make a statement with your appearance by choosing clothing and accessories that speak to you. This “Be Kind” Necklace is a simple and elegant way to remind yourself and others of the power of kindness (get 15% off with code FRIENDS15). Clothing lines like Shine The Light On create pieces that help raise awareness about mental health. Modern, minimalist messages imprinted on soft, luxurious fabrics make it simple to spread messages of hope and acceptance wherever you go. In addition to looking good while making a statement, a portion of the proceeds from the Shine The Light On collection goes towards mental health initiatives – so you can also feel good knowing that you are helping to end the stigma of mental illness. You don’t need to do your hair and makeup to look and feel good this spring, but you should always take care of your skin. Glowing, healthy skin looks good from the outside and can make a person feel good on the inside. As mothers, when we feel over-cuddled and overstimulated after a long day, it’s our skin and sense of touch that suffers. This is why caring for our skin plays such an important role in how we look and feel. Plus, the act of massaging lotion onto our skin can stimulate our lymphatic system and help keep our bodies healthy from the inside. So splurge on a good, all natural skin care line to make sure that you’re not coating your skin in chemicals. Soak in a bath filled with Epsom salts to help soften and relax your muscles. Use sunscreen all year round, especially when you plan to spend longer amounts of time outdoors. And make sure that you schedule yourself enough time each day to perform your daily skin care routine. Try a new look this spring. Cut or color your hair, try out a new clothing style or color that you would never normally wear. Get a piercing or tattoo, eyelash extensions, permanent makeup or micro-bladed eyebrows. You don’t need to go so far as getting plastic surgery, but if there are specific problem areas that have always bothered you, then consider booking an appointment with a doctor or dermatologist to discuss your options. Don’t be afraid of change, though it might take some time to get used to. Only make changes that are truly something you want to do, and never in an effort to please anyone else or be someone other than yourself. Changing something about your outward appearance can make you feel mysterious, spontaneous and empowered. Deciding to change something about your appearance should remind you that you are in control of your body and what happens to it. “The mom look” is normally one associated with comfort and function. But comfortable can also be beautiful so don’t feel like you need to trade one for the other. It is entirely possible to look good and feel comfortable at the same time, as long as you choose the right pieces. If you feel uncomfortable in your clothing, whether it’s shoes that pinch or a waistband that’s too tight, you will act uncomfortably. So just bite the bullet and get rid of anything that you hate wearing, no matter how expensive or “designer” it might be. Being comfortable in your own skin is the best way to show the world your confidence and beauty. I’m not normally the type of person to make New Year’s resolutions but there is just something about a new year that makes me feel inspired. It’s a great place to start if you’re looking to change your life and that’s exactly what the Running in Triangles blog has been for me. This month marks the two year anniversary of Running in Triangles and it has been quite a journey. When I first started, I knew that I wanted to talk openly about postpartum depression and help raise awareness about maternal mental health. But I had no idea what an impact it would make on my life and the lives of others. In 2017, I wrote about all kinds of things I learned while raising my three kids, from sleep training and breastfeeding to party planning. But it was my posts about postpartum depression that gained the most popularity, and the ones I felt most inspired to publish. Posts like 9 Reasons Why Mothers Don’t Speak Up About Postpartum Depression and 14 Ways to Help a Mother with Postpartum Depression were easy to write because they were the things that I’ve always wanted to say. Two years later, they are still some of the most popular posts on the blog and have inspired many women to speak up and seek help. I didn’t know it at the time, but those two posts have become the cornerstone content of Running in Triangles. The fact that women don’t talk about postpartum depression was something that needed to change and a big part of the problem is the lack of support. Their popularity confirmed what I already knew: women with postpartum depression wanted to speak up and their loved ones wanted to help them, but no one knew how or where to begin. This discovery led to last year’s Postpartum Depression Guest Post Series. It was my way of giving these women a safe space to tell their stories without worrying about being judged or criticized. I accepted and published every single guest post that was submitted, no matter who it was from. Of course, I led by example and shared my own postpartum depression story, which was not at all easy to do. I also tackled tougher topics such as intrusive thoughts, postpartum rage and feeling suicidal. As difficult as it was to research and write about these topics, I knew that mothers needed to be better informed about them. This past year, I spent a lot of time reading postpartum depression stories, participating in online support groups and watching YouTube videos of women trying to explain what it’s like, and their stories were all so unique. I read about women who spent thousands of dollars on fertility treatments to conceive, and others who ended up pregnant unexpectedly. I heard from women who had incredibly supportive spouses, and those who suffered from divorce and separation at the hand of postpartum depression. I watched some women struggle openly and others do everything in their power to hide what they were feeling. But one thing was the same… their pain. Knowing that thousands of other women, from all around the world, were dealing with the same pain, no matter their backgrounds, made me feel incredibly empowered; as if I had an army of women behind me who could validate my feelings. To help put it into perspective, I chose ten questions about postpartum depression and decided to ask as many women as possible to answer them. I am excited to see how the answers will compare and my hope is that they will prove to other women who might feel isolated and afraid of speaking up that they are not, in fact, alone. My goal for 2019 is to get at least 200 women with postpartum depression to answer these 10 questions. If you, or someone you know, has postpartum depression, please click below to submit your answers and help me share this questionnaire so that it can reach women from all around the world. Please note that by submitting this form and providing your e-mail address, you will be subscribed to the Postpartum Depression Survival Guide Newsletter and agree to be contacted via e-mail. Your e-mail address will never be published on Running in Triangles and you may unsubscribe at any time. In addition to this exciting challenge, I hope to continue providing more information about postpartum depression and maternal mental health this year. They say knowledge is power and it couldn’t be more true when it comes to mental health. Being misunderstood, judged and stigmatized are some of the biggest barriers for a woman with postpartum depression and it’s my mission to change that. Thank you so much to all of my supporters, readers, contributors and of course, to my fellow postpartum depression survivors who inspire me to keep going. How Long Has it Been Since Your Postpartum Depression First Started? 3. How long has it been since your postpartum depression first started? 8 years. I have had 2 more children since my first diagnosis. With my third and final delivery I was diagnosed with PPD/PPA psychosis. – Ashley G.
Postpartum depression can last long after the postpartum period. There’s a misconception that postpartum depression is a disorder that only affects moms in the “new baby stage.” While the first three months are normally when postpartum depression shows the first symptoms, it can last a whole lot longer than many realize. Postpartum depression can relapse upon the birth of another child, stress, illness, trauma or another trigger. Without treatment, it can be a lifelong battle. Seek treatment. Don’t expect postpartum depression to go away on it’s own, even if your symptoms start to get better. As your baby gets older, you’ll likely be able to fit in more sleep and better self care, which means the symptoms may ease up. But there are several different options available that can improve your quality of life now and in the long run. In addition to anti-depressants, there are different types of therapy available such as cognitive behavior therapy, and video therapy sessions. Author Vanessa RapisardaPosted on January 5, 2019 April 1, 2019 Categories 10 Questions About Postpartum DepressionTags antidepressants for postpartum depression, baby blues, baby blues or postpartum depression, do I have postpartum depression, having another baby after postpartum depression, help for postpartum depression, how long does postpartum depression last, how to get rid of postpartum depression, how to know if you have postpartum depression, maternal mental health, online therapy for postpartum depression, PND, postnatal depression, postpartum anxiety, postpartum depression treatment, postpartum depression triggers, symptoms of postpartum depression, treatment options for postpartum depressionLeave a comment on How Long Has it Been Since Your Postpartum Depression First Started? Most women with postpartum depression know two things – that they should talk about it, and that they don’t want to. New mothers are bombarded with information telling them that they need to speak up if they just aren’t feeling right. But they don’t – and for several good reasons. So how do we bridge the gap between the terrified mothers living silently in darkness and the concerned support system who can only help if they know what’s wrong? Ending the stigma surrounding mental illness would break down so many barriers. And more women talking about postpartum depression would help to do that. The women who DO speak up, are courageous for doing so. They have decided to ask for help and tell their stories, despite the barriers presented by the medical system and society in general. Here are some tips for women who want to know how to talk about postpartum depression. **Furthermore, I am not a medical professional and nothing in this post should be taken as medical advice. I am simply a mother who has been there and lived to tell the tale. Reading the stories of other mothers can help you figure out how to talk about postpartum depression. Try to read as many stories as you can, because each mother’s experience is different. You never know which ones will relate to you specifically. And if you find a story that feels like the author took the words right out of your mouth – then save it and read it over and over again. Share it on social media or with someone you love. Let the courage of other woman inspire you to want to share your own story. If you want to know how to talk about postpartum depression, then you need to practice what you’re going to say. Writing it out is a great first step. You don’t need to be a professional writer nor feel any obligation to share your story with anyone. Write it just for you. Write it out on paper, in pen, so that you can’t erase or delete anything. You can scribble words out but they will still be there like an everlasting reminder that running away from your thoughts doesn’t help. Write about the bad stuff that you’re too afraid to say out loud. Write about the sad stuff and keep writing even when your tears soak through the paper. Write about all the hopes and dreams that haven’t come true for you yet. When you’re done writing it out – you will want to burn it or tear it up into a million pieces and flush it. But instead of doing that, find the courage to keep it. It will help you greatly when you are ready to talk about postpartum depression. Bonus: Download and print this free PDF workbook to write about your thoughts in. Helping someone else who is in the same situation as you are is a great way to learn how to talk about postpartum depression. One way to do this by joining a private online support group where you can talk more freely with strangers. Mothers are usually quite honest and open in these groups and ask questions about everything from medications to marriage problems. If you don’t feel quite ready to ask your own questions, then start by answering one for another mother. Supporting someone else is incredibly empowering and can give you the courage to talk about your own struggle with postpartum depression. No one knows how to talk about postpartum depression better than a survivor. I should mention that, when it comes to maternal mental illness, there are no REAL survivors because there is no REAL cure. A woman who has lived through the worst of it in the first year postpartum. A woman who decided she needed help and asked for it. A woman who spoke up about what she was going through. A woman who made changes in her life to avoid the chances of a relapse. A woman who has established a treatment plan. A woman who’s mind told her to end it all but she didn’t. Survivors are still battling the pain of postpartum depression and/or are at risk for a relapse. But survivors have one thing that you don’t… they have spoken up about postpartum depression and lived to tell the tale. So find a survivor and ask them how to talk about postpartum depression. Fighting a battle alone is never a good plan, no matter how much courage you have. It is much easier to talk about postpartum depression when you have someone holding your hand. Asking for help with postpartum depression doesn’t always mean asking for medication or therapy. Asking for help can mean something as simple as helping you talk to someone about what you’re going through. Who do you want to talk to about postpartum depression? Your spouse? Your doctor? Your family or friends? Find a person or group to stand with you as you do it (physically or virtually). Having someone else there for “emotional support” can give you the courage you need to speak up, and also hold you accountable so you can’t back out at the last minute. One option to consider if you’d like help to speak openly about your postpartum depression to your family and friends is to access an online psychiatrist. Thanks to the privacy and anonymity that it offers, you can speak to a licensed professional, on your own time, without anyone needing to know until you are ready. Find out more at Online-Therapy.com. Make a list of all the things keeping you silent. Which one do you fear the most? Are you afraid you will be treated like a criminal or child abuser? That your children will be taken away from you, or that your spouse will leave you? Maybe you’re worried that someone will judge you, say insensitive things to you or avoid you altogether? Now make a list of all the reasons why you want to speak up. Are you struggling and don’t know how to cope? Do you want to be a better mother and wife? Do you want others to know why you’ve been acting strange? Do you feel alone? Are you scared of what you might do? Contemplating suicide? Which list is your worst case scenario? Don’t wait for something bad to happen before you decide to talk about postpartum depression. Think carefully about the consequences of staying silent when you should be speaking up. Talking about it won’t be easy, and neither is battling in silence – but wouldn’t you rather have an army by your side to fight the war raging inside of you? Thinking about the future can help you decide how to talk about postpartum depression. It’s easy to get wrapped up in all the darkness happening right now, but the future is that light at the end of the tunnel. Without help or a plan to get better, the future seems bleak. It seems like a never-ending life of sadness and despair. Imagine what you want your future to look like. Do you want to have more children? Think about watching your children grow up, helping them with homework and taking family vacations. Aim to achieve it instead of mourn what would be. So make a 1, 5, and 10 year plan for your life. Having a future will give you something to fight for. The simple act of talking about postpartum depression can feel like an insurmountable task for many mothers. The hundreds of reasons for staying silent are completely valid and understandable. Postpartum depression is a private matter and there is no need for the entire world to know about a mother’s inner most thoughts and feelings. But the hundreds of reasons for speaking up are also valid. It will take a lot of courage, and make a person feel exposed and vulnerable. But it means that you won’t have to fight this battle alone. And if you don’t have to fight it alone, you have a much better chance of winning. Don’t wait for someone to ask you how you’re feeling, take matters into your own hands and find the courage to speak up. Ready to talk about postpartum depression? I can help you share your story! Oh Canada – the land of free healthcare! While healthcare in Canada is free for citizens – and I wouldn’t want it any other way – it can be a challenge for mothers to find and access proper postpartum depression resources. Obviously, speaking to a doctor would be the first step. But often, our family doctors, obstetricians or gynecologists were not our first choice, but rather, the ones with the shortest waiting list. It’s difficult to speak to someone about something as personal as postpartum depression when a strong relationship doesn’t exist. For mothers in Canada, it’s important to have a list of postpartum depression resources we can access when we don’t get the answers we were looking for from our primary healthcare providers. Free healthcare doesn’t have to mean that our options are limited. PSI (postpartum.net) is perhaps one of the best postpartum depression resources available to women regardless of where you live. View their list of postpartum depression resources in Canada for contacts you can reach out to in each province. At the bottom of the page, you can get information for different support groups available in cities across Canada. The PSI helpline is available to Canadians (and internationally). If you’re not sure where to begin on your journey to recovery, but simply know that you need help, calling this number is a great first step. A postpartum doula is a fairly newer trend in postpartum support. While many women hire doulas to help them through labor and delivery, a postpartum doula is specifically there to help you in the postpartum period. They will do anything that you need – from helping with the baby to cleaning the house and running errands. Even if you have the support of a spouse or family members, a trained doula comes with a ton of knowledge, both about newborn baby care and maternal mental health. So if you’re struggling, or worried about getting through the postpartum period on your own – consider hiring a postpartum doula to help. The best places to find a postpartum doula near you is by searching the member directories on professional certification websites. A Canadian organization that trains doulas and childbirth educators. They offer listings of doula practices by province. An international organization for doula training and certification. Check out their list of CAPPA certified postpartum doulas in Canada. A non-profit organization that supports doulas and other professional childbirth educators. Their list includes both certified and non-certified doulas in Canada. An online support group is a great resource for mothers suffering from postpartum depression and other maternal mental health disorders. There is something so freeing about chatting with a stranger, commenting on posts from women who feel exactly the same as you do, and being able to share any knowledge you’ve come across or support another mother who is struggling. The Canadian Postpartum Depression Support Network on Facebook has over 600 members and is a very active group with extremely supportive members who comment on nearly every post almost immediately. There is a benefit to joining a specifically Canadian group, as the members can relate to the healthcare system and treatment options available. Join this group here. Postpartum Depression & Anxiety Support Group is a Facebook group run by Patricia Tomasi – maternal mental health writer for Huffington Post Canada. With over 1700 members, you’ll find great discussions and a very supportive group. Join this group here. You can also follow her Facebook page for lots of great information and articles about maternal mental health. Postpartum Support International has their own Facebook group as well and it has well over 8,000 members. You are sure to get a response and lots of support from women all over the world who are struggling with maternal mental health issues. Join this group here. Mother Matters is an 8 week online support group open to residents of Ontario. It is run by the Mental Health Program at Women’s College Hospital, and registration must be done in advance. Find out more here. If you’re looking for a more specific group, simply search on Facebook groups for one. Once you find a group that’s the right fit, it can easily become one of your most treasured postpartum depression resources. In addition to Postpartum Support International’s Helpline, there are several local crisis hotlines available throughout Canada. A crisis hotline is available 24 hours a day in the event of an emergency or if you are contemplating suicide, hurting yourself or hurting someone else. The hotline operators are trained to handle emergency situations, especially those pertaining to mental health, so you can rest assured that they will understand what you are going through. A local crisis hotline is one of the most important postpartum depression resources to keep nearby in case your mental health worsens suddenly. In the event that you need physical intervention or support, help can be dispatched immediately. Counseling is an excellent treatment option for women with postpartum depression, however, there are many barriers to meeting with a counselor in person. Online counseling is a much better option for mothers with postpartum depression. Through sites such as Online Therapy and BetterHelp, mothers will be matched with a counselor based on their needs, and the sessions conveniently take place from the privacy of their own home. The Pact For The Cure is a research study being conducted in Canada by the Women’s College Hospital in Toronto, Ontario. (It’s also being run in several other countries by their own sponsors). They are currently trying to collect information from women who have postpartum depression or postpartum psychosis. With this information, they will hopefully be able to find out the cause of postpartum depression as well as develop better programs and treatment options. To take part in the study is very simple – it just requires downloading a free app and answering a few questions. In addition to contributing to this important study, the app provides postpartum depression resources, such as a tip of the week and important phone numbers. By answering the questionnaire, you will also be given a score on the Edinburgh Postnatal Depression Scale (EPDS) which is a tool most health professionals use to diagnose postpartum depression. You can take a version of the test here. If you score high on the test, you may be asked to give a genetic sample to provide even more information. It’s completely optional and confidential, but a great opportunity to do your part in finding a solution. Join the PPD ACT Genetic Research Study here. Aside from anti-depressants, there are many all-natural and herbal supplements available that can help with the symptoms of postpartum depression. If you’re not sure of how and where to begin researching which natural treatment options are best for you, I suggest you start with the End Your Depression Treatment Plan. You can read my full review of the e-book here for more information. In addition to vitamins and supplements, self-care plays a big role in women’s mental health. Trying to find the right products to help with relaxation and self care can also be difficult and expensive. One of the best online sites to purchase health and wellness products in Canada is Well.ca. Whatever natural products you need for your own self-care routine and to help improve your mental health can be found here. Check out Well.ca’s Women’s Health Section to find all the products you’re currently using. Aromatherapy has amazing health and mood-boosting benefits. There are so many different blends and oils available to treat specific symptoms and create a more positive environment. Learn more about how aromatherapy can benefit you. Decent, Canadian, online shopping sites are surprisingly good postpartum depression resources because it’s difficult to find the motivation to leave the house to find the products we need for our own health. Postpartum depression is dark and ugly. It’s shocking and harsh and evil and all the bad things in the world. But it’s also something beautiful. It’s powerful and real and truthful. A postpartum depression story, when shared with the world, can change lives. To see what I mean, check out some of the stories from brave sufferers and survivors of postpartum depression in The Ultimate Collection of Postpartum Depression Stories. Are you ready to turn your postpartum depression story into something beautiful? Answer these 10 common questions to show other women that they are not alone. Or, consider starting your own blog! Mental health bloggers are doing some incredible things to help spread awareness and end the stigma by speaking up and sharing their stories. If you’re interested in learning how to start your own mental health blog, check out this tutorial: How to Start Blogging About Postpartum Depression. It’s unfortunate that there isn’t enough awareness about postpartum depression resources in Canada. There are a few groups on Facebook that are working hard towards spreading awareness, including Maternal Mental Health Progress in Canada and Postpartum Depression Awareness and they’re definitely worth a follow. Know of a Canadian postpartum depression resource that’s not on this list? Let me know! It’s hard to know for sure if you’re suffering from a maternal mental health disorder, and even then, it’s hard to know which level of intensity you’re experiencing. The baby blues is something that so many mothers experience, but when do you know if it’s turned into something more? Postpartum depression is often explained away as a bad case of the baby blues when, in reality, it’s much more serious. Here’s what it felt like first hand. Shortly after the birth of my first child I experienced symptoms of what I believe were the “baby blues.” They didn’t last long and they didn’t disrupt my life (much). The sleep deprivation added to my emotional state. The way someone would feel after staying up partying all night long (which may or may not be a familiar feeling for me *wink wink*). I felt irritable and edgy but sleep (when I could get it) was welcome and helped to alleviate the stress. [Keep track of how much sleep you’re getting each night]. I blamed the extreme “mom brain” on the sleep deprivation as well. It was probably one of the hardest symptoms for me to manage as someone who prides themselves on having a great memory. Suddenly I couldn’t multi-task because I would forget what I was doing in the first place. I wrote down absolutely everything in a log book, significant or not, in a vain attempt to remember when I last fed him. I didn’t bond with the baby as much as I thought I would. I spent a lot of time talking to him but the lack of a response discouraged me. I wasn’t absolutely head over heels in love with him the way motherhood is portrayed in the media. While I didn’t have any negative feelings, I felt very indifferent towards him. We didn’t get out of the house much at first. I was extremely overprotective of him and convinced that he would contract bad germs from strangers. Aside from worrying, I honestly just didn’t feel like leaving the comfort of my own home. It eventually went away on it’s own. Similar to a really bad case of PMS, I started to feel “normal” again. I didn’t cry at the mere thought of something sad and I couldn’t wait to get out of the house and socialize. By the time he was 2 months old he was smiling, making eye contact and interacting and I did fall head over heels in love with him. After the birth of my second child, things felt a little bit different. That first baby that I didn’t bond with? Well he was two years old now and the absolute center of my world. So for the first couple months, things were monotonous and scheduled and boring – as long as the baby was concerned, at least. She had basic needs and I didn’t try too hard to bond with her. I knew that would happen eventually so I didn’t put too much pressure on myself this time. The first two months after her birth were extremely busy in my social life so I didn’t have time to stew over the fact that life as I knew it had completely changed. I was tired and emotional but this time I couldn’t sleep no matter how hard I tried. Every time I closed my eyes I thought I heard the baby cry and got up to check on her. Sometimes it was 15 times in an hour but I couldn’t stop myself because I knew the one time I didn’t check on her would be the time something bad happened. If someone else offered to look after her while I took a nap, then I would lie in bed for 2 hours worrying if she was alright. The mood swings were extreme and uncontrollable. As the weeks went on, I started to despise her. I blamed her for everything I was feeling. She felt my negative feelings and cried harder and longer which made me dislike her even more. But then I would think about how I’ve always wanted to have a daughter and I would suffocate her in love – until she started crying again. The slightest things could send me into fits of rage and I got offended and jealous very easily. I was terrified to leave the house with her. I was certain she would cry and I wouldn’t be able to handle her and everyone would stare at me and think I was a horrible mother. So I stayed in my house where no one could judge me. I avoided contact with almost everyone. And the worst part of all was that I lied about what I was feeling to everyone. I felt humiliated and inadequate and worthless but I hid it the best I could. I dressed the baby up in cute outfits and took cute pictures of her to post on social media. I posted captions about how much I loved having a baby girl and how all of my dreams had come true but in reality I just wanted to rewind life to a time before she existed. The more I tried to “fix” things, the worse they got. Even when I tried to “snap out of it” the baby was still reacting to my negative energy and crying all day and night. My brain was full of terrible ways I could get her to shut up but instead I locked myself in the bathroom and cried for what seemed like hours. The guilt eventually built up huge walls that closed in on me. I even contemplated suicide. For months I battled in silence, not knowing it was postpartum depression. I kept waiting for this funk to pass, waiting for the “hormones to regulate” but they never did, not without help, that is. 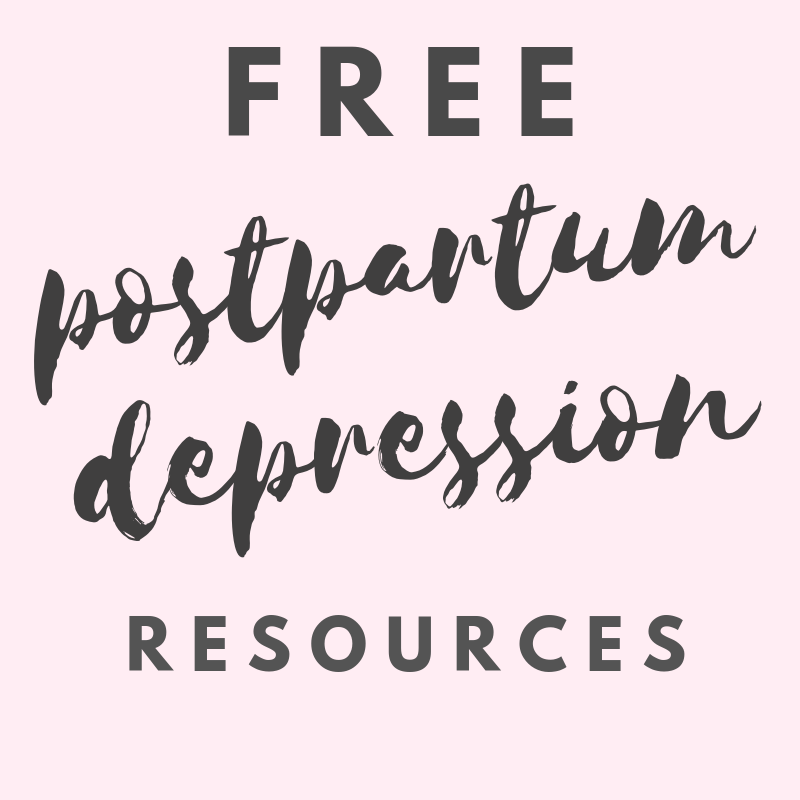 For more information about postpartum depression and other maternal mental health disorders, check out this comprehensive guide from Parenting Pod. Considering I went to hell and back with my last baby, I must have been absolutely crazy to have another one, right? The postpartum depression was forefront in my mind but this time I felt more prepared. I knew what to look for, and I knew that I needed to speak up if I felt something was even a little bit off. The first time she was placed in my arms, I felt it. That immediate love that legends were made of. I couldn’t wait to hold her and I didn’t want to do anything else except just stare at her perfect face. The early days with her were peaceful and calm – despite the sleepless nights. The other two children often played with each other and so I had her all to myself. The fact that she couldn’t talk back to me actually made me want to spend MORE time with her! Trying to balance three children was definitely a challenge, and extremely overwhelming at times, but instead of being afraid and nervous and frustrated – I felt excited and determined to make the best of it! I felt like I could control my mood. Even on days when she was extra fussy or I was extra tired, I always managed to stay calm and relaxed around her. I never felt a sad or negative thought about her. And she was a calm and relaxed baby because of it. Initially I worried about how the older children would handle the new baby. But they never once showed any signs of jealousy towards her and completely welcomed her into our family. I cried more tears of joy in her first few months than I ever have in my life. I worried about how much she ate, pooped and slept and whether she was hitting her milestones on time. Mostly because I was always comparing her to the other children. In an attempt to get things right this time, I asked a lot of questions, I sought a lot of help and I socialized as often as possible. I took all three kids out as often as I could. It was next to impossible to manage all of them in public (and it still is) but I sure didn’t want to get stuck inside the house with them! I can’t say for certain what factors affected these different postpartum outcomes but this is the way it worked out for me. After my battle with postpartum depression, having another baby was not in the plans but she surprised us all and I’m glad she did. When I think about life with a newborn, I try my hardest to reflect on the happiness of my last one, but will never forget the darkness that came before.